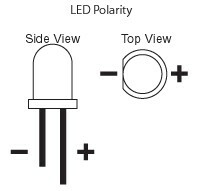 Leds have a negative and a positive connection. In the picture below you can see this. The long pin is always the positive connection and the short pin the negative.If you have an old led with cut off pins you can still find out which pin is what by looking for the flat side of the led. The pin nearest to the flat side of the led is the negative pin. All are most common about 20ma. If you want to connect a led to a power supply that gives more output in volts then needed you need to connect a resistor to the led. You can order these resistor at this webshop. You only have to choose the wanted voltage and we will provide you with the right resistors for your leds. We always supply you with the save resistor version. You can find these resistors in the menu resistors / resistors other.